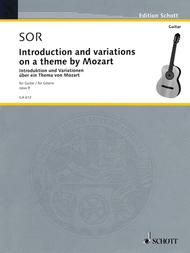 Introduction and Variations on a Theme of Mozart, Op. 9 (Guitar Solo). Composed by Fernando Sor (1778-1839). Arranged by Narcisio Yepes. For Guitar. Gitarren-Archiv (Guitar Archive). 16 pages. Schott Music #GA612. Published by Schott Music (HL.49010973).